I loved the terrace, especially the way the sunlight hit the magenta coloured walls of the buildings. 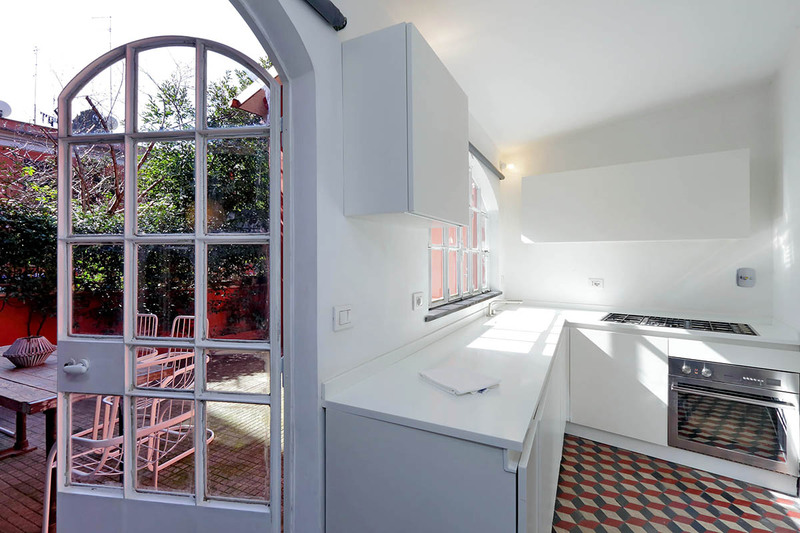 Wonderful kitchen, with the arched window. 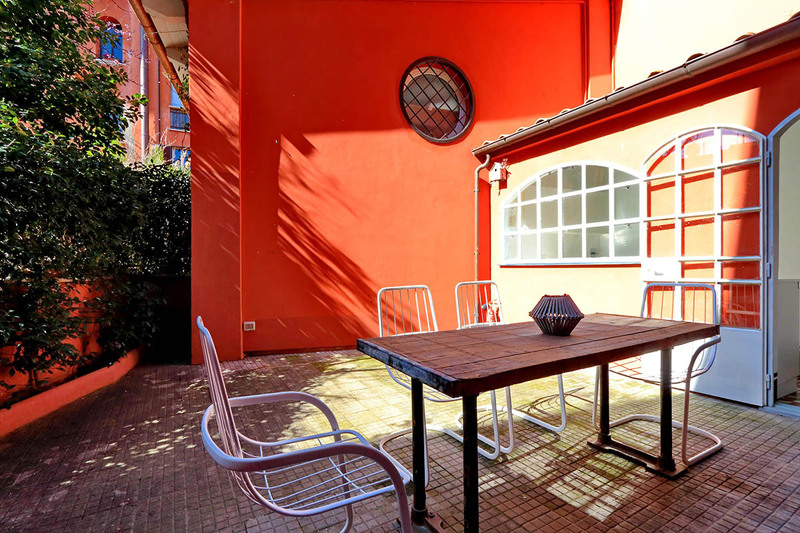 Located in the heart of the Eternal city, this Trastevere terrace apartment is located in a quiet area, just a few steps away from the Gianicolo park. 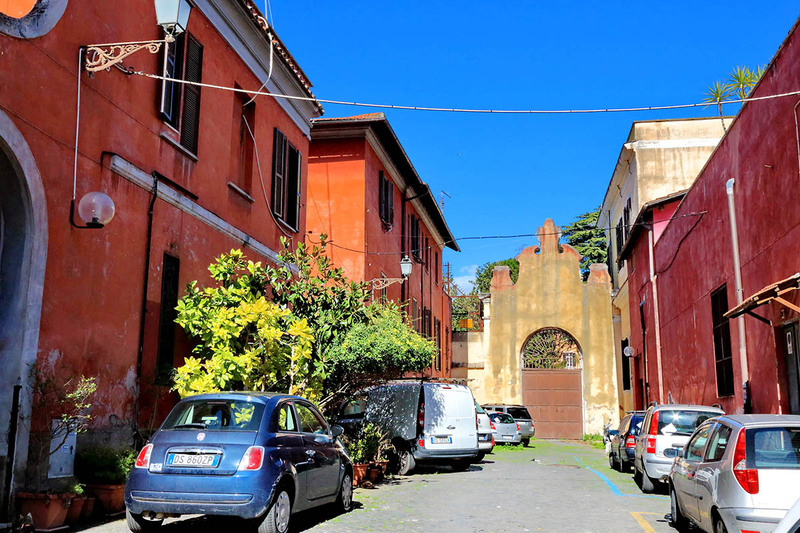 This two bedroom apartment is ideal for families or friends that want to be in the centre of Rome and be able to reach all the main sights by foot. 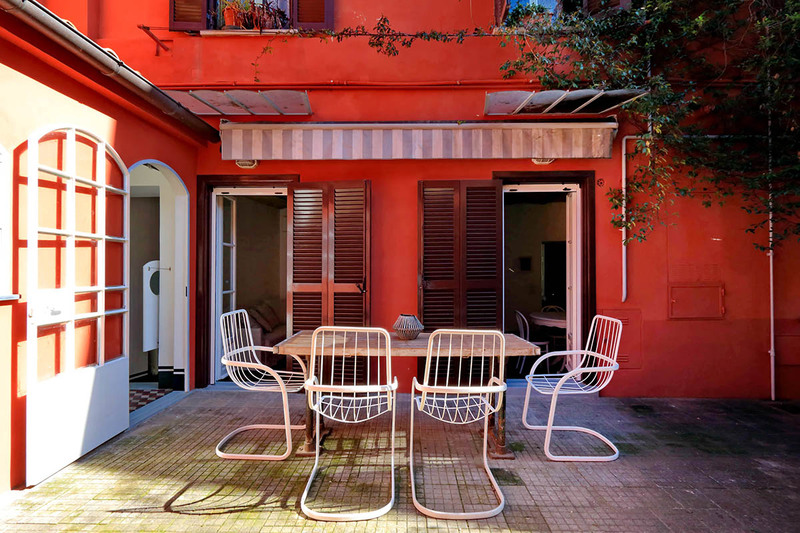 This Rome holiday apartment is on the ground floor of a very colorful building and has its own private entrance. 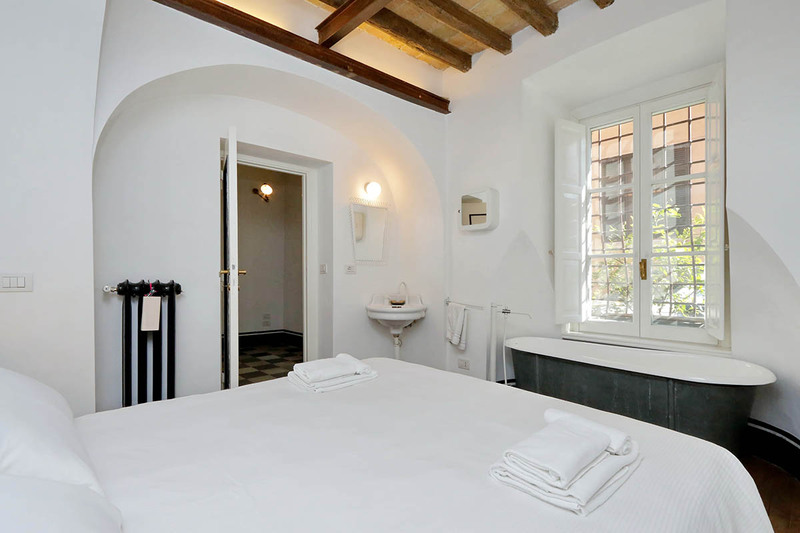 Even though in the heart of buzzing Trastevere, the apartment is found in a very quiet corner. 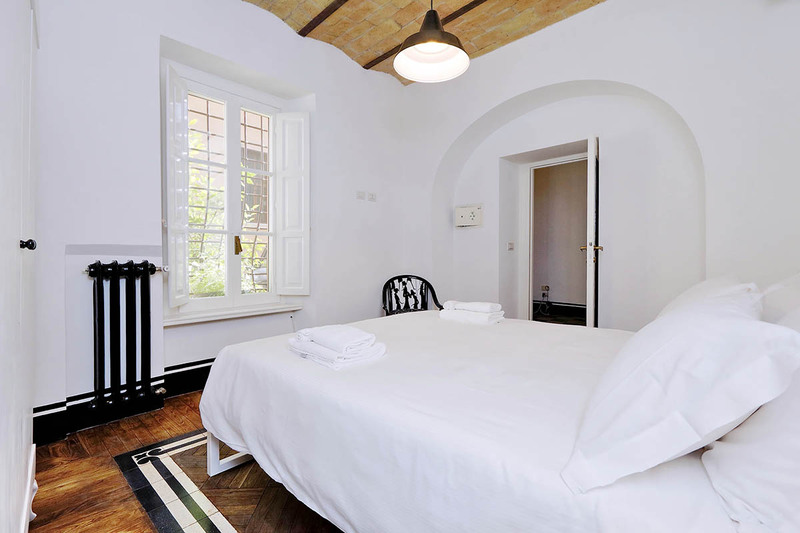 Guests enter the property via its large courtyard, which has a peaceful and relaxing atmosphere. You will be able to enjoy meals outside, either in its sunny or shady areas. There is a large outdoor dining table with chairs: the perfect setting for an evening meal. 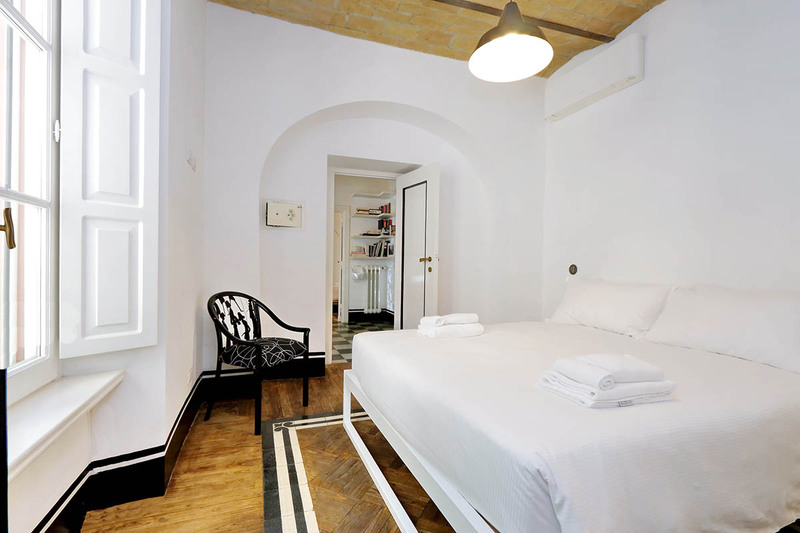 Inside this very “Art Deco” apartment, you initially find the living room, which is composed of a sofa bed (sleeping up to 2 people), a dining table where you can sit all together if the weather does not permit “al fresco” dining. 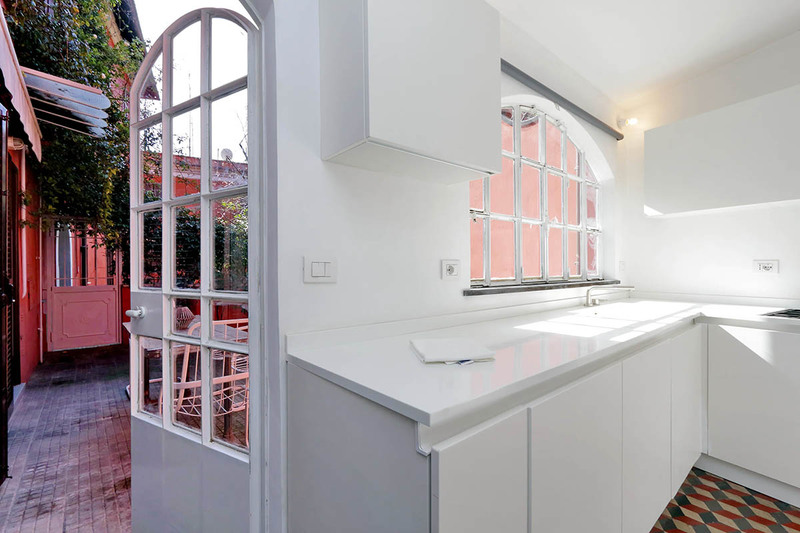 Right next to this, you will find a fully equipped kitchen, where you will be able to test out all the Italian recipes you have learnt from the Roman inhabitants. Oven, stove, fridge… everything that you could possibly need in a kitchen. 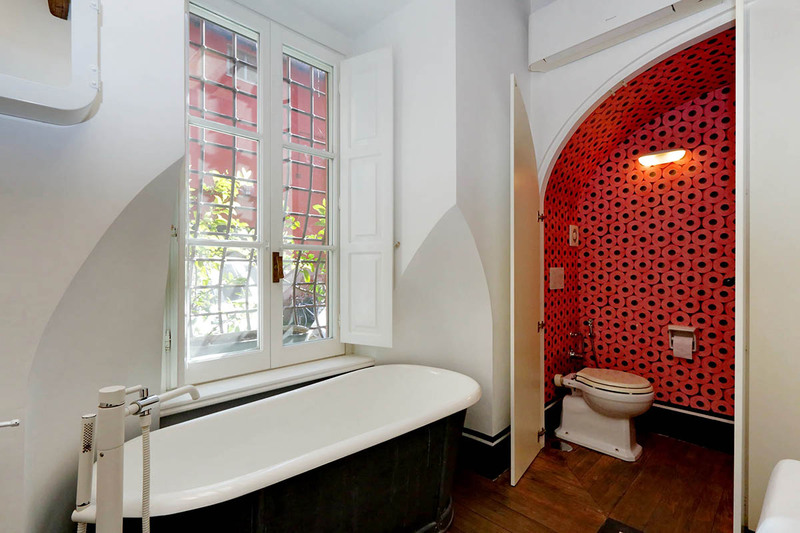 In this area, you will find a small bathroom with shower. Just off the living area, you will find two bedrooms. The first bedroom has a large double bed and wardrobe. 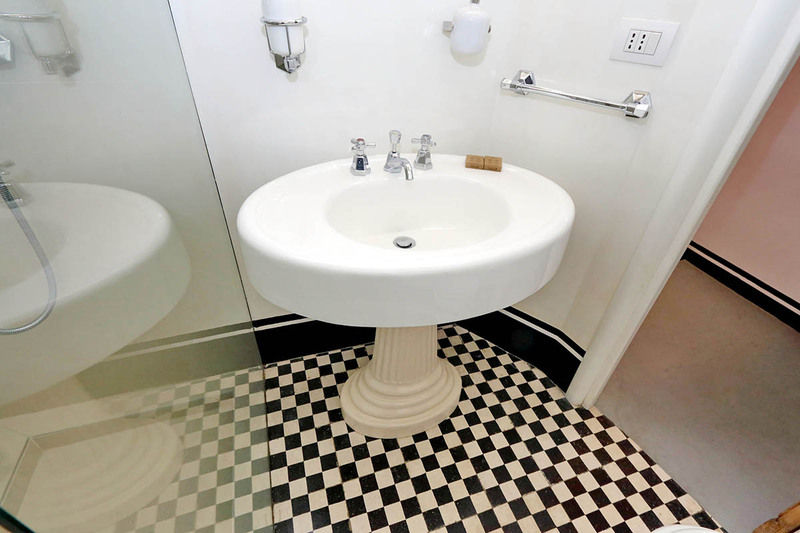 Inside the bedroom there is a beautiful bathtub and just off the room, there is a small ensuite bathroom with sink and toilet. 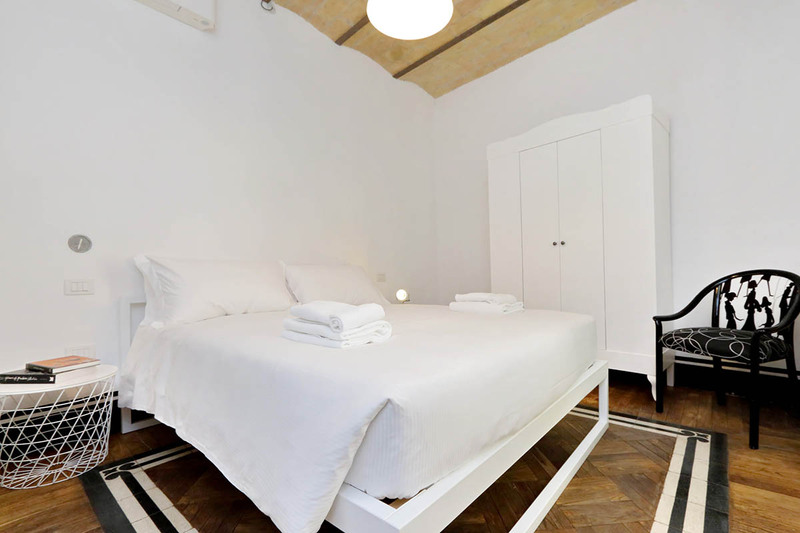 The second bedroom also has a large double bed and wardrobe. Unfortunately pets are not allowed in this apartment. Trastevere is very well known for its typical restaurants and bars. You will find the best Osterias of Rome like Da Augusto o Osteria dei Numeri Primi and taste the best pizzas and pastas ever! The area is very lively and laid back, and you will not have any difficulties in making new Roman friends. 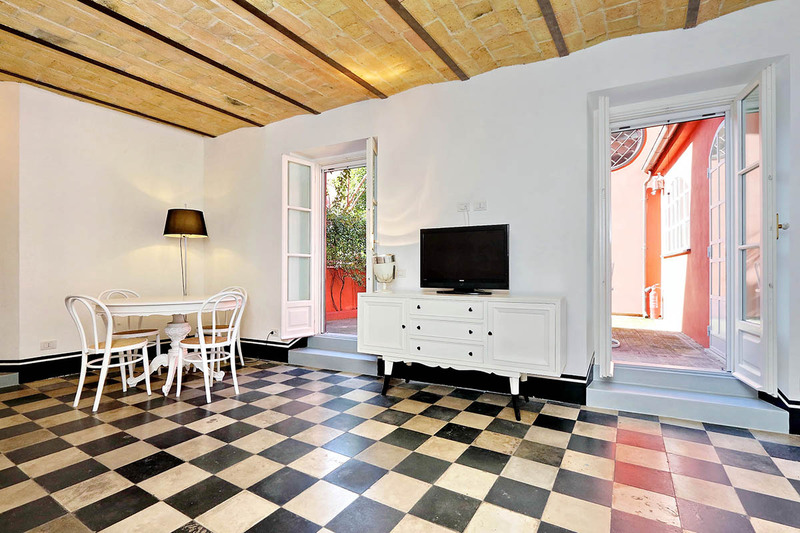 To visit the area, there is nothing better than getting lost, amongst the cobbled streets and pretty piazzas. 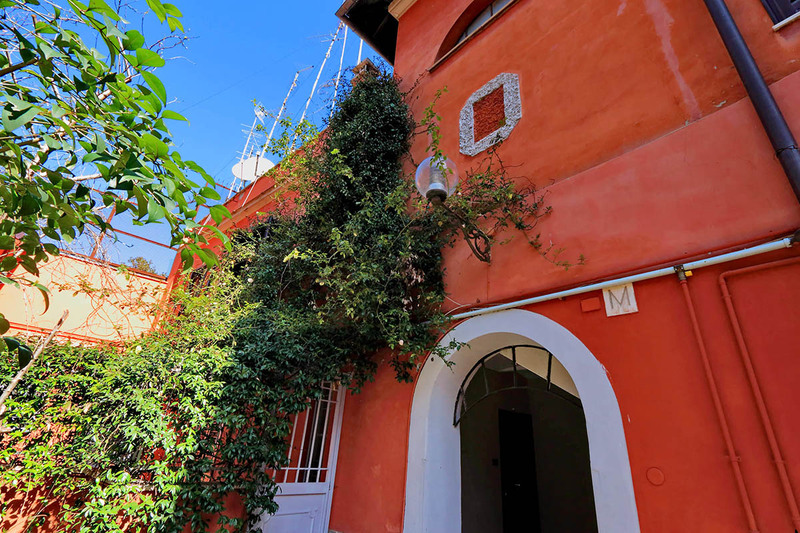 Behind Trastevere rises the Gianicolo Hill, on top of which you will find the Piazzale Garibaldi. Take a seat and admire stunning views of the city whilst the sun sets. It feels as though time stops. 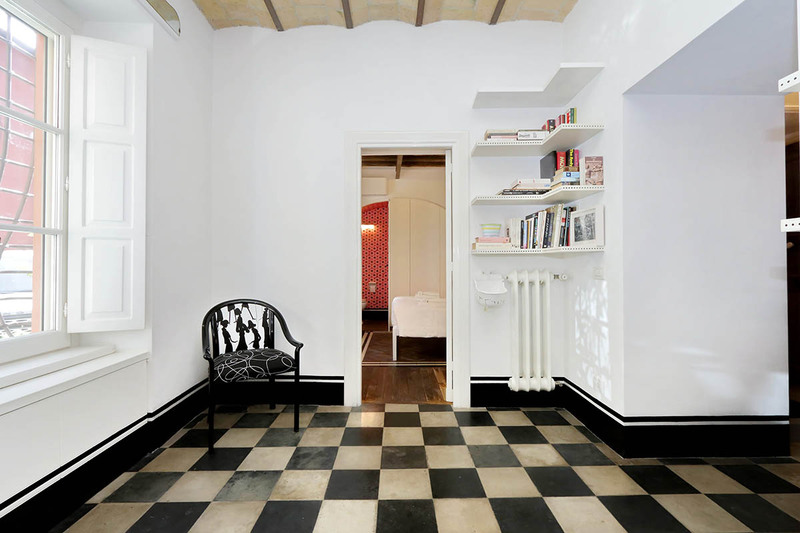 It will be easy for you to reach all the main monuments from this Rome holiday apartment. 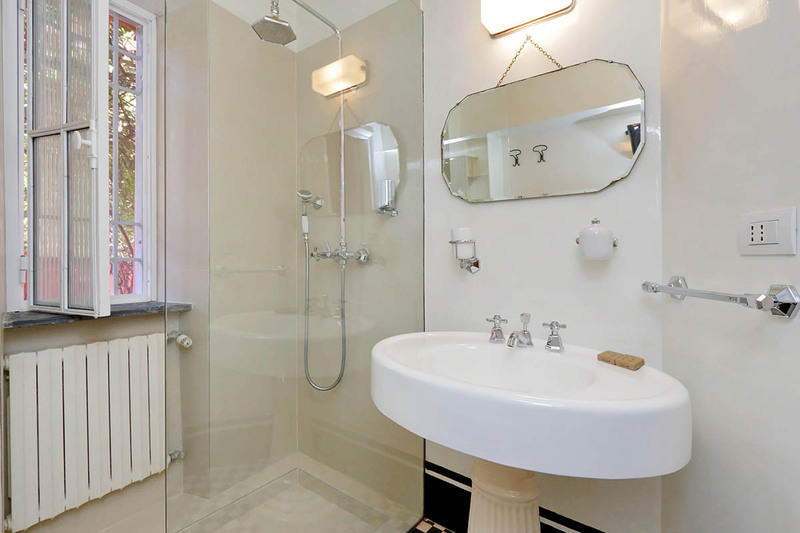 Pantheon, Spanish Steps, Trevi Fountain, and Piazza Venezia are all within walking distance. Do not miss Campo de’ Fiori piazza, where each day, except Sundays, there is a fruit and vegetable market. Here you will be able to taste fresh and typical products, but above all it is the best place to watch Roman life in action. The Piazza del Popolo and Colosseum are slightly further away, but are also easily reachable on foot! 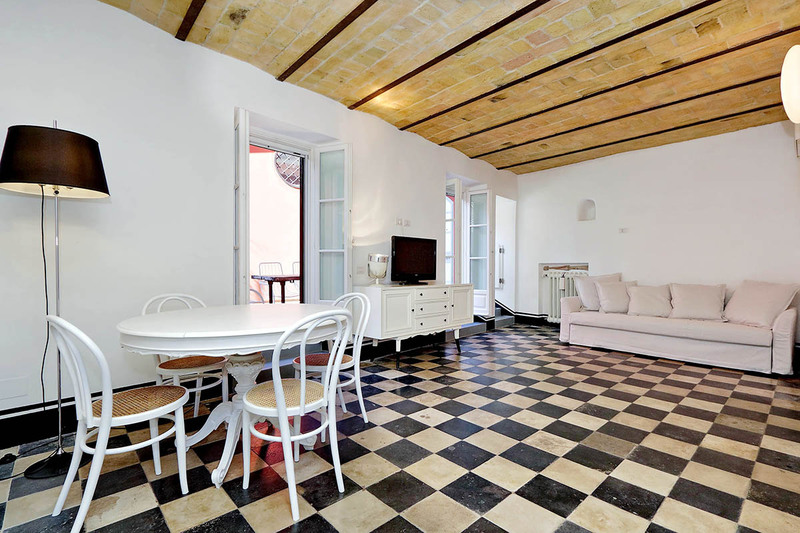 7 people are currently looking for apartments in Trastevere area. Reserve yours now. I have passed a wonderful stay in this lovely apartment ! Me and my friends couldn't dreamed better for our trip in Rome, We all enjoyed so much the furnished and charming terrace for our evening, sharing an "aperitivo". 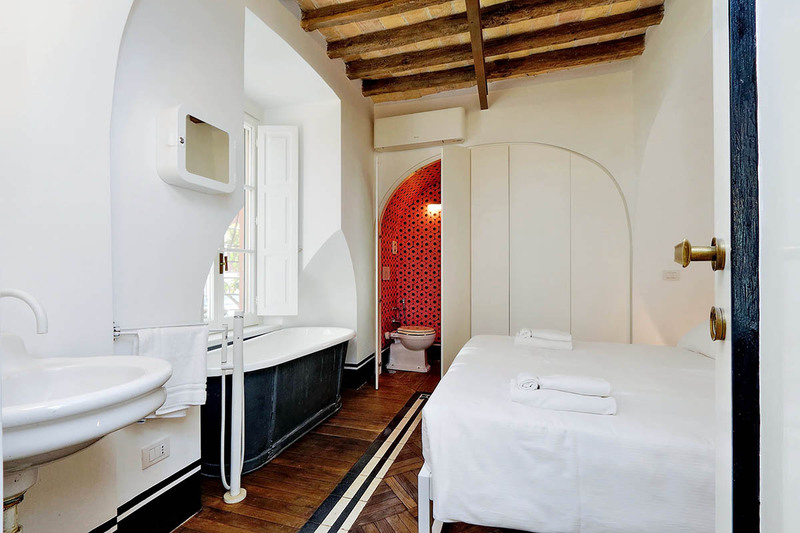 We had all the comfort expected thanks to the 2 bedrooms. 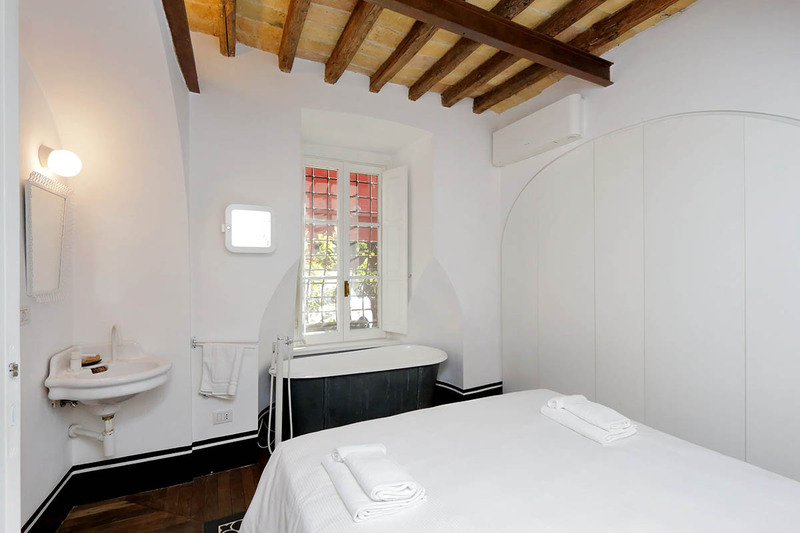 Also very well located in Trastevere We could enjoy ...Read Morethe nightlife and still stay far from the noise of Trastevere. Well, I truly recommend this apartment !